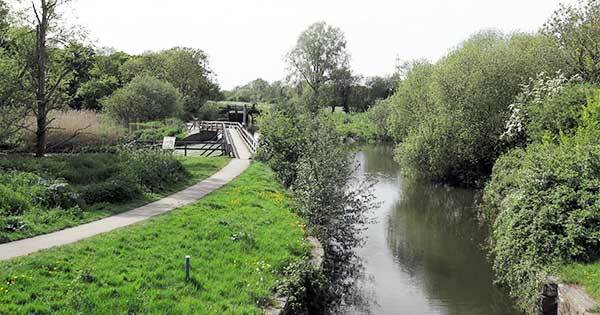 Beeleigh is home to some of the falls and locks and weir on the Chelmer and Blackwater Navigation. The area also contains Beeleigh Abbey and the Beeleigh Millhouse and remains of the mill. 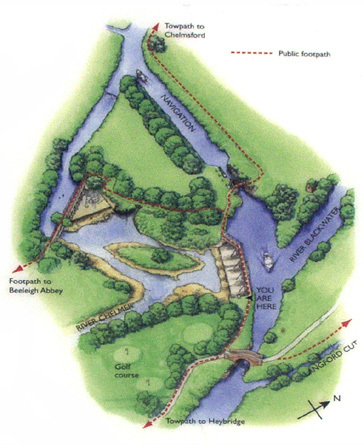 Shown is a photograph of the visitors' map situated at Beeleigh weir and shows the Blackwater joining the navigation. The river Chelmer continues to Maldon passing Fullbridge before reaching the Hythe where it becomes known as the Blackwater. The navigation continues to the sea lock at Heybridge Basin. You reach Beeleigh on foot by joining the canal alongside the Tesco car park or drive along the private road which runs from the side of the Museum of Power at Langford. There is limited parking by the bridge. See the map below for details.